Simple answer: someone who went online and got ordained just to be able to marry people. Not necessarily a pastor of a church. In the State of Georgia, there are only two types of people who can marry a couple: Judges and Clergy. We do not have “Justice of the Peace” here in the State of Georgia. If someone claims to be a Justice of the Peace, they are not legally able to marry a couple in the State of Georgia. standing next to a carriage. I just love the arrow pointing to me! Oh wait, it’s pointing to the crosswalk! “Clergy” can be any religious figure: pastor, chaplain, rabbi, preacher, imam, sangha, priest, bishop, maybe even prophet. 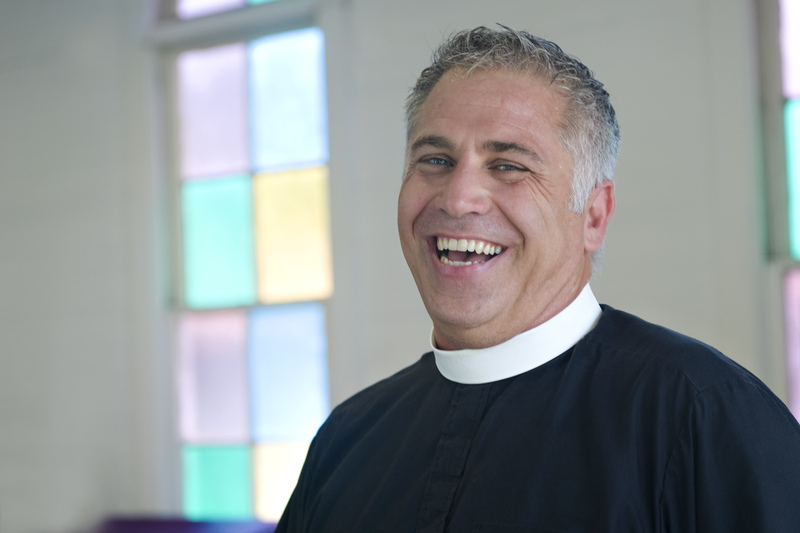 Nearly all the time, a clergy person has had religious training and schooling. For example, in order to be a Lutheran Pastor, I had to have a Bachelors Degree prior to entering seminary (which is an additional 4 year program). Making it a total 8 years of educational instruction after high school. In order to be a “non-denominational officiant” it takes about 20 minutes and some money, then in the eyes of the State of Georgia it qualifies them to be a person who is considered “clergy.” Those persons often call themselves Reverend, because technically they are. I too am a Reverend, yet it took me more than 20 minutes. I’ve heard of many people going online to get ordained to marry couples, celebrities often do that in order to marry a celebrity couple. Am I opposed to these non-demoninational wedding officiants? Only when they pretend to be a pastor or religious leader, maybe wearing clergy collar and attire, or when they don’t even believe in God and only do this for the money (I doubt they go to worship services anywhere). How do you know if your wedding officiant has a religious educational background, such as myself, or went online? Simple: ask them. Is hiring a friend as an officiant a good idea? Let me say for starters, that the word is officiant (noun). If the person that you’re thinking about hiring doesn’t spell the word correctly, you’ll want to continue to look. It’s a great idea to have a friend or family member officiate (verb) at a wedding. I was the officiant at my younger brother’s wedding. That was 7 years ago, and I’d been officiating weddings for 10 years at that time. First, even if they are used to speaking in front of others, how will they handle the unexpected? A crying baby, an outdoor ceremony with a loud motorcycle? Or take for instance, will they know to look at the couple during the exchange of vows to see if their face/eyes start to show emotions/tears? Will they know how to handle that: will they pause or just plow right through? And, this is a tougher one: when people became emotional they will laugh or cry. Often times people laugh during the vows rather than cry, and it can be very disconcerting. Imagine the groom repeating after the officiant, “I promise to be faithful to you,” and then the groom starts to laugh, or the bride starts to laugh. How will the officiant handle that? I’ve also seen officiants get so nervous they NEVER look at the couple: they only read from the papers in their folder. Will the officiant tell the bride when to hand off the flowers? Or what if they forget to tell the guests to sit down? I’ve seen a couple weddings where guests stood the entire time because the officiant either forgot to stay anything or didn’t realize they were standing because they never looked up. It is a very high honor to preside at a wedding – I never take it lightly. Why hire an experienced professional wedding vendor? What do you do for living? Imagine you’re leaving for a one day vacation and a temp is brought in. How well will they do? Will you be comfortable leaving your job to this person, knowing when you come back things will probably be a mess? The same goes for having an inexperienced person participating in one of the most important days of your life. I’m not saying you shouldn’t ask a family or friend to take part of your special day. I’m asking you to take a look at it from their point of view. Once I saw an officiant do his first wedding. Going into it he was so calm and comfortable. But as soon as it started he got so nervous (and it was so obvious on his face) that he skipped over 1/2 of the ceremony, including the rings! Afterwards, during the reception, he told me it was MUCH more difficult than he ever thought. In fact he said he’d never do it again! Also, you may not want to ask a parent to be the officiant. If my son asked me to officiate, I would say no. My reasoning is this, I can’t be the officiant and father of the groom at the same time. i can’t do the duel role and be in the moment. It’s not possible to be the father of the groom, enjoying that proud moment, while being the officiant. Speaking of family members having a role, albeit officiant, photographer, coordinator, florist, if I were to be asked to officiate a relatives wedding (sibling, niece, or nephew) I would say no. And if the day comes that I would be asked by a grandchild to officiate their wedding, I would say no. I want to have a single role and focus. Oh, BTW, I didn’t answer the headline question did I? If you want family or friend(s) to participate in your wedding day, have them do a reading, or give them a special role that you say that it is so important that they do it: brining marriage license; bringing rings; being your personal assistant (taking care of bringing dress, makeup, hair products, etc.) There are so many things which need to be done, that I’m sure you can make them feel special by giving them a special small part/role for your wedding and/or rehearsal. Do you know the TV show “Holmes on Homes”? It’s about home construction contractors taking advantage of unsuspecting home owners, duping them out of thousands of dollars. I write this blog because I have learned of some recent events which really bother me. There are good and not so good people in this world. There are some who take advantage of others, some who steal. And unfortunately there are one or two not so good people in Savannah. Below is a list of local wedding coordinators with whom I have worked. And I will work with them again, as I’ve never heard anyone being taken advantage of by these people. From This Day Forward: Weddings and Events. There may be others, but at this late hour I do not recall them, but will gladly add them to this list if they are so kind as to let me know. I really want to get this blog up and published, please read on. If you ask me about a coordinator in town, I will tell you one of two things. Have you looked at others? I will not say that a company is bad or has a bad reputation in town, probably for legal reasons. However, I will strongly suggest you review vendors. And please note: that you also need to ask other Wedding Professionals in Savannah about other people. This is a small community and everybody knows everybody, both those who are good and those who are questionable. And finally, I do not have a huge ego nor am I arrogant about my abilities. If I don’t know a wedding vendor, then they are either new to this area or …. My concern is that nobody be taken advantage of, like the couple I worked with today. Not only was this couple deployed while arranging their wedding, (one is Iraq and one in Afghanistan). Then they were duped out of over $3,800. They had a two year old child murdered about a year ago. So not only do they have to cope with the death of child but also being taken advantage of while planning their wedding day all while they were serving our country. Because of a really good coordinator stepping in, their day was fantastic! Also be leery of a local company when they don’t use their own names in the website. And just because a company has a high number of traffic listed on the “counter” at the bottom of a page, doesn’t make them reputable. I want your day to be outstanding and if I can help, i will do the best I can. Should you read reviews of vendors? Yes. And there are site which allow brides and grooms to review their wedding vendors. And I encourage you to go to them. There are vendors who have a large number of reviews and there are vendors with very few. And each one is rated by the bride and/or groom. For example, the most known site, Wedding Wire. A vendor is rated with stars, from 0-5, with 5 being the best. You can find my latest reviews on Wedding Wire at this link. Another site is Wedding Mapper, it is not as well known and I only have two reviews on there..
Why is it important to read reviews? When you go buy a new car, I would hope you’d check out the reviews of the car. For example, I recently purchased a pre-owned car (or is it pre-loved car?). I went online to Kelly Blue Books and read up on the value of the car. I also went to Consumer Reports, online, and read some reviews. And I went and checked out Technical Service Bulletins (if a particular make of car has too many TSB’s, that will lead to a recall.) I knew what problems may occur when I purchased the car. 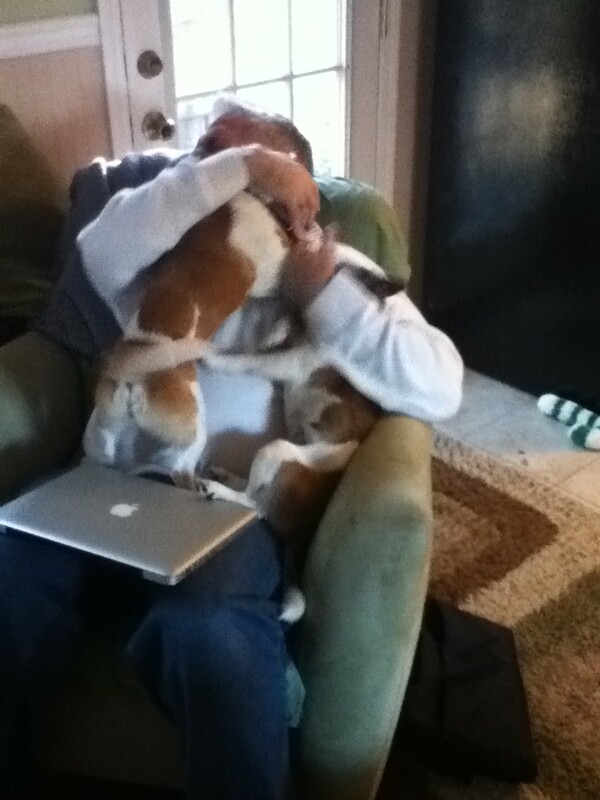 Our two new rescue dogs (Dec. 22, 2010), they were two days away from being euthanized. They are great dogs! I don’t know of other wedding vendor review sites, so if you do, please let me know and I’ll post them here. There are draw backs to sites like Wedding Wire. Some vendors may strongly encourage brides and grooms to fill out a review. For example, on Trip Advisor (not a wedding site), I know of one bed and breakfast who has been in business for about 3 years, yet has over 400 reviews. Hmmm… And I know of a bed and breakfast in business for 7+ years and only has 65 reviews. Also, if you look closely at review sites (even best buy has this option) you can sort the reviews from lowest to highest. Often times the most recent review is first. On one of my reviews you’ll read where I arrived by pedi-cab to a wedding. Yup, I sure did! The bride and groom wanted their wedding at the same time I was already booked, 4pm. So, they were willing to move their start time to 4:30pm, since their wedding was only two squares away, because they wanted me as their officiant. I was going to walk, but decided it was too hot that day to walk and not get sweaty. The answer was Pedicab! I flagged down a pedicab prior to the 4pm wedding, paid him to wait for me and then had him take me to the 4:30pm wedding. I arrived 7 minutes early!! And lastly, if there is a lastly, google a person or business. For example, I found out about a wedding officiant who will not only be the minister at your wedding, but will clean your house, walk your dog, grocery shop and wash your car for you. 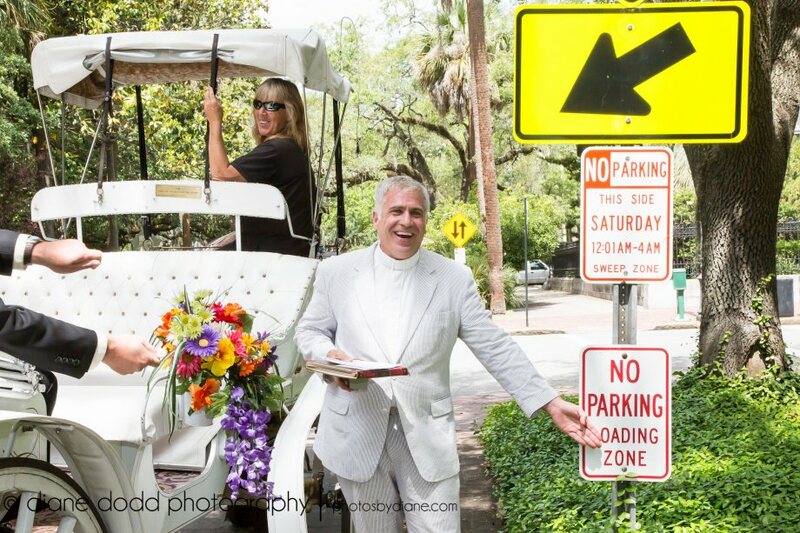 Are there wedding chapels in the City of Savannah for your destination wedding or elopement? The church’s name is St. Luke’s Lutheran Church. We’re working on the website images, as we have a new look! But I’ll try to attach a photo of it to this blog entry. If I can’t, then it will be done asap. The photo to the right was taken by Donna Von Bruening. So why consider the 1902 chapel vs. a place like Bethesda Chapel. Well for one, we have restrooms. They don’t. You have to drive to the local grocery store or gas station for one, unless you rent a port-a-pot. The restrooms we have are brand new and are ADA compliant. Next we have two NEW great hvac systems that do the job! We are only 10 minutes from downtown, not 20+ minutes, to name just a few.